Recalled centre Jonathan Davies says Wales' World Cup quarter-final clash against Ireland on Saturday amounts to a "local derby". The teams will battle for a place in the final four 12,000 miles from home. But the Scarlet points to Six Nations and Pro12 League familiarity as the background to the encounter in Wellington. "We've played against each other so many times it's almost like a local derby," said Davies. "It's the fact that we're pretty close, Scotland and England as well, you always want to get one up and back home the public love it as well. "So it is a huge game Saturday." And the 23-year-old believes Wales' route to the latter stages following their opening defeat by South Africa has already forced them to take a "knock-out" approach. 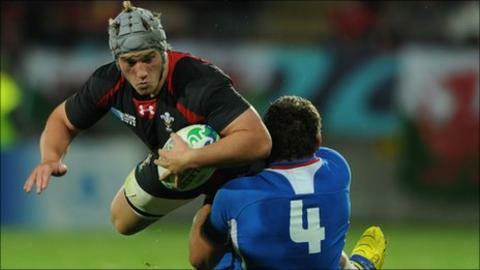 Wales went on to beat Samoa 17-10, before hammering Namibia and Fiji. "After the South Africa loss, it was almost knock-out rugby for us then. "We had to make sure we won every game and we've done that so we're used to this pressure being on us, making sure we have to win and nothing changes on Saturday - we've got to get a win." Jamie Roberts' midfield partner is one of eight matchday squad members aged aged 23 or under. But Davies says even though the party's most capped player, Stephen Jones, has been overlooked, he and his fellow veterans can be credited with helping the new generation come to fruition. Davies said: "There's a lot of experience in this squad as well and I think it's a great mix and a lot of players have brought us on. "Stephen Jones has played a huge part in bringing on the young Scarlets who are coming through into the squad and the other regions as well. "I think a lot can be taken out of that good mix of experience and youth." With vastly experienced Brian O'Driscoll and Gordon D'Arcy to take on, Davies says Wales must win the gain line battle if they are to reach the semi-finals for the first time since the inaugural tournament in 1987. Davies said: "Test match rugby is all about getting go-forward and momentum over that gain line and with the ball-carriers we've got, it's worked so far and hopefully come Saturday we can get our runners into the game and get momentum. "We've been together so long we're all comfortable with what we're doing now and understand what the coaches want as well. "I think everything's coming into place quite nicely." Ireland, the 2009 Six Nations Grand Slam champions, boast a 100% record at this year's World Cup and shocked pre-tournament favourites Australia with a 15-6 victory on the way to topping Pool C.
Wales: Leigh Halfpenny (Cardiff Blues); George North (Scarlets), Jonathan Davies (Scarlets), Jamie Roberts (Cardiff Blues), Shane Williams (Ospreys); Rhys Priestland (Scarlets), Mike Phillips (Bayonne); Gethin Jenkins (Cardiff Blues), Huw Bennett (Ospreys), Adam Jones (Ospreys), Luke Charteris (Dragons), Alun Wyn Jones (Ospreys), Dan Lydiate (Dragons) Sam Warburton (Cardiff Blues, capt), Toby Faletau (Dragons). Replacements: Lloyd Burns (Dragons), Paul James (Ospreys), Bradley Davies (Cardiff Blues), Ryan Jones (Ospreys), Lloyd Williams (Cardiff Blues), James Hook (Perpignan), Scott Williams (Scarlets). For the latest Rugby World Cup news and reaction to this story and our daily . And have your say on Twitter using the hashtag #bbcsportsday.